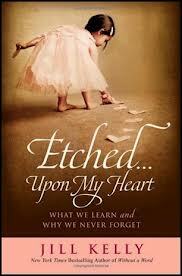 I recently read ‘Etched… Upon My Heart’ written full of love and faith by Jill Kelly. Mrs. Kelly filled the pages of this book with so much of herself that I feel like I know her. Many times throughout reading it I felt like I was reading a mirror image of issues that have occurred in my own life. I truly love the way God gave her the ability to share, not only her own hardships and joys, but also that He gave her the words to interpret understanding of His love, lessons, and word on each and every page. Jill Kelly fills the book with such personal and private accounts of her life that I can only imagine the pain, tears, and even laughter that came about as she poured out the memories of her journey. Many of her stories touched me in a way not only allowed me to feel her pain but also to understand more the way God works in one’s life. Jill and her family went through a parent’s worst nightmare, the death of a child, and instead of being defeated or succumbing to the statistics, they came out stronger. The story of their son Hunter, tucked within the pages of Jill Kelly’s life lessons, will now forever inspire as a beacon of God’s great love. About the Author: Jill Kelly is the wife of former Buffalo Bills quarterback Jim Kelly. In September 1997, months after their infant son, Hunter, was diagnosed with a fatal disease called Krabbe Leukodystrophy, Jim and Jill founded the Hunter’s Hope Foundation. As chairman of the board of Hunter’s Hope, Jill helps children suffering from Leukodystrophy, and their families by raising awareness and research funds to fight this devastating disease. She and Jim live in Buffalo, NY, with their two daughters and three dogs. Hunter’s Hope Foundation can be found online at www.HuntersHope.org. Jill is also the author of Without A Word. “Jill courageously allows us into the rawest moments of her personal journey, and invites us to join the process by which love is defined, fear becomes faith, and suffering becomes sovereign. “I am taken … with the words in ETCHED…UPON MY HEART and the heart of the writer who wrote them, Jill Kelly. As a mother, Jill spoke to the place in me that desires to make a lasting imprint on my children’s lives. As a woman, she touched the place in me that knows well of the struggle to love, lose, forgive, live faithfully, find significance. As a believer in Jesus, she stirred my deep gratitude for redemption and the God who makes all things well. $15 Wal-Mart Gift Card giveaway entered. I love the picture with the author (?) with her hands up in the air. She looks so free. Thanks for linking up to Journeys of The Zoo’s Tuesday Facebook Giveaway Wall. hunter’s hope was so touching. I like the site. Romantic and soothing in feel. I loved the website. I enjoyed reading about what Hunter’s Hope is and what they do. I like the picture of the beach on the main page – so peaceful! I like the color choices and designs.